It’s time to correct a major shortcoming in this blog, namely the missing coverage about the artist who deserves superlatives – Spencer Kincy aka Gemini. A member of the mid-nineties guild of Chicago house producers who were headquartered at the labels like Relief and Cajual, Gemini shaped both the new deep and engaging sound from the Windy City. However, “A Moment Of Insanity”, his first twelve in my collection, was issued in Detroit, on Carl Craig’s Planet E, and Gemini also put out music on French Distance, UK’s Peacefrog – to mention a few of them. Still his best works appeared on the abovementioned home town labels. 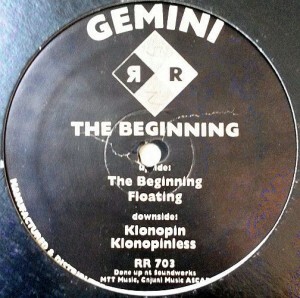 Gemini’s heart has been beating for house music while many of his tunes have a rougher edge – a well-fitting example is “The Beginning”, a revered masterpiece from the early days of Relief Records in 1994. In the A-side’s title track Gemini is a true Church of House disciple, who is fascinated by the lazy yet sensual groove and proclaims religiously ‘and this is the beginning!’. After soulful introduction, the next cut “Floating” announces the transition to technoid mood with a brusque bass line and heavier kicks. On the flip we find the EP’s most played and licensed track “Klonopin” – allegedly named after a tranquilliser brand Kincy was using that time. Proper drum work, naughty claps and hoarse shouts ‘gemini!’ make it a floor burner forever while its twin “Klonopinless” relies on the same patterns with a portion of extra percussion. At the end of the nineties, Gemini sadly disappeared from the public, which has been explained with his alleged mental hardship and social troubles resulting from this condition. The long-lasting silence does not affect his standing as a legendary producer and in recent years, German reissues label Chiwax has made his legacy accessible to a wider and younger audience. Forthcoming this summer is Gemini’s classic album “Imagine A Nation”, to be unearthed on Anotherday Records.